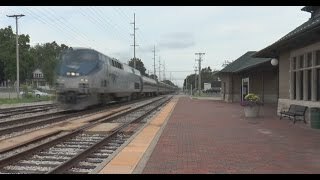 On the night/morning of October 10/11, 2012, Big Jim Video Productions once again visited Princeton Junction, NJ, as it was rumored that the Acela Express trains would be attemping another crack at 165 mph - and perhaps faster. With my photographer friend Mitch on the platform with me (thanks for the ride and company, Mitch) the tests started a bit later than was thought - around 11:45 pm. The first one flew by (was it close to the 165 mph of last time? ), but then the second one inexplicably stopped at the station. Was it a problem, or a brake test? Who knows... The third runby wasn't exactly motoring along, and the fourth one stopped just past the station again. The fifth and sixth ones, however, absolutely flew by. That last run seemed much faster - could it have been faster than 165, even over 170 mph? That could have tied or eclipsed the mark set on December 20, 1967 by one of the UAC Turboliner trains, the fastest speed ever recorded on the Northeast Corridor. Was it actually faster? One day we may find out...in the meantime, enjoy this video and the new entrance video as well! These trains are capable of amazing things, but the infrastructure... isn't. My apologies. I have removed the comment. Nice work. YEEAAAAAAA BABY! If the Acela is trying to hit 180 I will fly up there to see it! 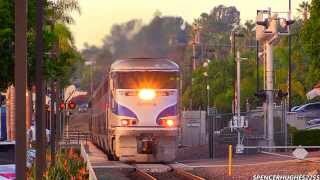 +AcelaRailfan2150 I remember riding the acela and I could actually feel the acceleration stop when it hit 150. 150mph felt like a piece of cake on that train. I would think 30mph faster wouldnt be too much trouble. Don't know, to be honest with you. I believe the x2000 will blast the Acela out of the water. Peter Lombardi Why, thank you very much!! 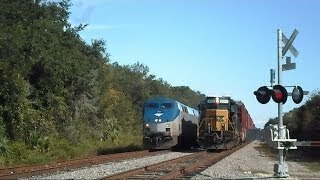 Did a quick math calculation, the last train was only going a bit over 150mph, looked faster. It sure felt like 180 - or really really fast - as it sped by me. 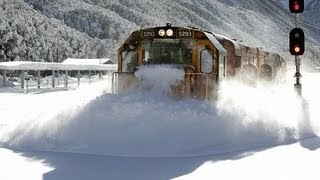 The rush of the air that the train displaces and the noise it makes - wow! 1:57 Should be the speed the Acela should run on. But R.I.P the weak overhead wires. The United Aircraft Turbo was geared for 165 mph. It was mechanically driven with up to 4 turbine engines in each control unit one of which was offline to provide HEP. It was slow to accelerate and hampered its entire life by a top speed of 100 mph. Each turbine was rated at 650 horsepower delivered to the drive unit and the drive unit was a one speed unit meaning there weren't any gears to shift. Once you hit 100 mph is where the train came alive and responded well above 100 to throttle commands but it used fuel voraciously and for its entire life it was a demonstration train, every night it deadheaded from Boston over 70 miles back to its maintenance base in Rhode Island. 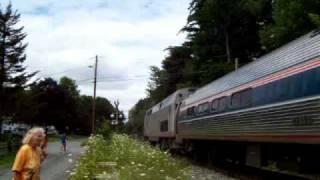 The Canadian National turbotrains were true trains having several cars between the power cars unlike the US version which had one car between the power cars. 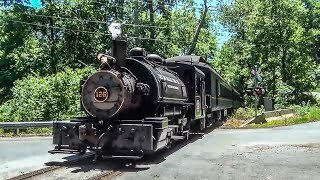 While cruising at 100 or higher you could actually feel and see the bottom of the train kicking out as designed to allow its higher speed in curves by lowering the center of gravity by the pendulum suspension system it had. 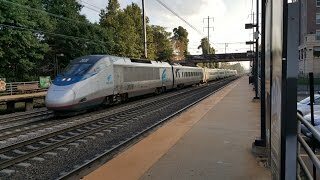 The TGV/Acela is a much better alternative for high speed passenger service. 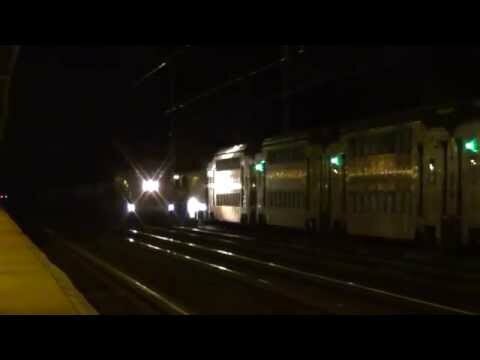 And just as a bit of information about the Acela the trains that were running 165 mph on test runs weren't modified other than resetting the top speed the train was allowed to run at as they were delivered with a top speed gearing of 200 mph which is how the TGV was delivered to the SNCF. 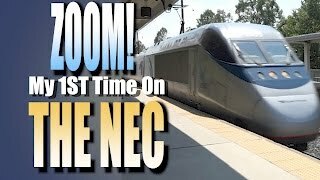 A top speed of 200 allows easy running at the scheduled speed of 186 mph so with the present Acela equipment if we had the track and wire to run on we could run at a cruising speed of 186 mph. True. If only we had the track to run it on! Your statement makes no sense. Top speed of 100 mph means it couldn't go above 100, then you say it worked best at speeds above 100...?? 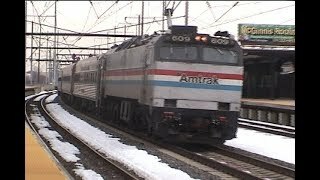 Acela needs to hit 200+ MPHs. Its not built for that. The Acela was designed with 150mph service speed in mind, 175mph may be the ceiling of its performance. Lol! 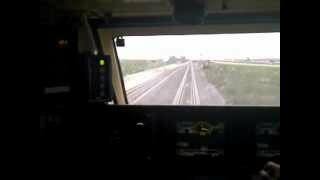 I think the driver was playing train sim in the cab and forget to reset the alerter! How is it now that I realized that it's a joke. 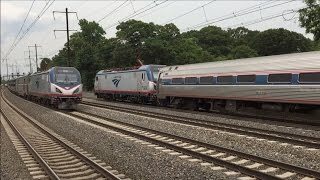 It's definitely testing, it has 10003, the Acela's test car, and that might've been high speed testing along the route. It had 7 cars not 6, like the normal Acela train sets have. 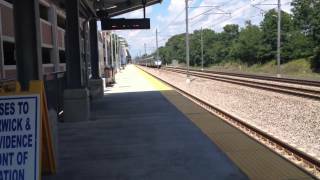 Sorry, but Acela traction motors are geared for a top speed of 165. The motors are limited from exceeding that speed because that is their designed limit. Acelas have been cleared for 150 between New Brunswick and Trenton since they started operations, so it's not much of an improvement. The biggest drag to this train is the section on MNRR north of NYC where the tilting system is disabled (forcing them to slow down even more for curves) and they're allowed only 90 even though the track can theoretically support 135 or above. +GintaPPE1000 Actually, all of your information is incorrect. Acela trainsets can most certainly exceed 165 MPH. During the tests last year on the Shore Line (east of New Haven) they reached speeds of over 170. Secondly, Acela's are not now (nor have they ever been) allowed to exceed 135 ANYWHERE between NYC and Washington during normal use. The only place Acela's regularly go 150 is certain sections in MA and RI. Lastly, tilting is not disabled on MNRR. It was at one point due to potential clearance issues but that rule went away years ago. Acela trains have their tilting enabled from Boston to Washington all the time. 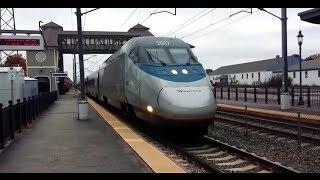 That being said with or without tilting the Acela speeds on MNRR are identical to all passenger train speeds because of track and catenary issues. It has nothing to do with tilting. 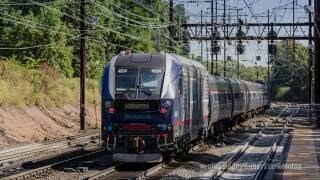 The fastest speed for any passenger train on MNRR's New Haven line is 80MPH. None of their track on the line is good for any higher speeds. 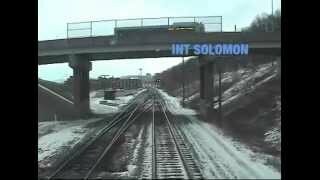 Not sure where you got the information that MNRR tracks are theoretically good for 135? The majority of their track is wood ties with a max speed of 70mph. It will be a decade at least before the catenary system, signal system and bridges are upgraded to get speeds anywhere near even 100mph. +Rail Roader Top speed usually refers to maximum *sustained* speed over level terrain. Almost all electric locomotives have a "boost" mode that can temporarily increase output, which is what gives them a higher maximum speed than what they were designed for, however their official maximum speed (using the definition above) is 165. Lot of arcing - too much pan bounce!??? Fixed tension at this location. Theoretically the wires in this section of the NEC are constant-tension (it's too hard to guarantee a constant power supply without it above certain speeds; American regulation states above 135, I believe). In practice, that's difficult to maintain even for countries like France with developed HSR infrastructure. The arcing results from the train running across either rough spots in the track or sags in the wire and losing contact or pushing against the wire too hard. Either the driver was to lazy, or that the train is running late. What is 170 mph in km/h? 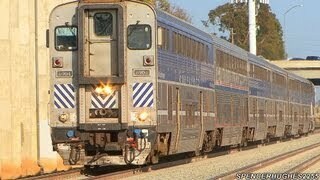 This is an example of how all trains should run, ballz to da wallz baby. 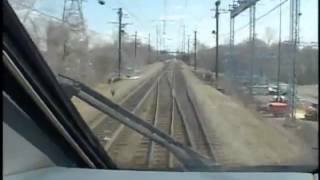 Acela Express' Meet At 150 MPH Speed !!! Acela Cab Ride....How Fast Can She Go? 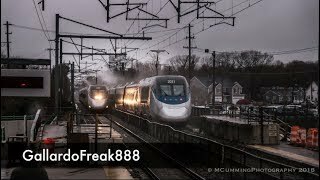 The best of high speed Acela's!